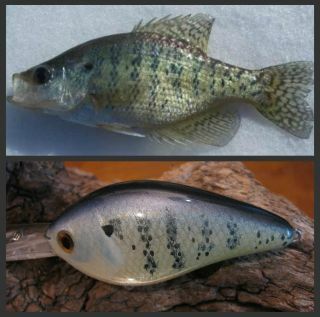 Does anyone have a recipe for a blue gill they wouldn't mind posting? Pics would be great also. Thanks. You guy`s seem to know alot of colors so please help me with this . Ken The Fin "Fishing is Fintastic"
Tried several of these cookbooks as you call them and really like them.But no one has posted any new ones in quite some time. why so tight lipped. Ill post a blue gill color ive done real well on tonight. One ive had a hard time with is a bar fish anyone tried this one. looks something like a white bass. bigtime forage fish on southern lakes like lake fork.Any ideas please post. Anybody got a cool recipe for "Texas Chicken"? 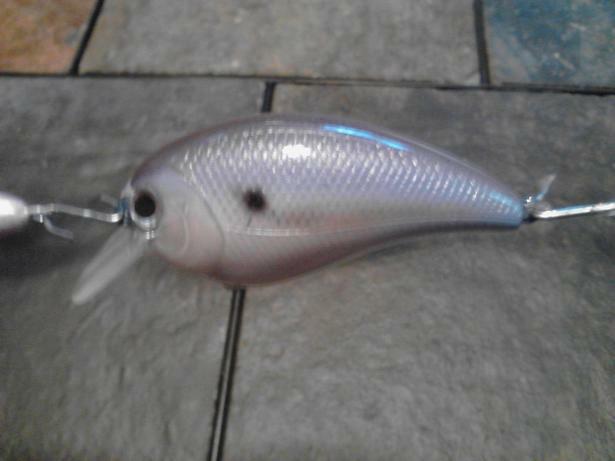 It's a jerkbait color that was discontinued......probably more of a saltwater pattern. Pink back/white sides and yellow belly. 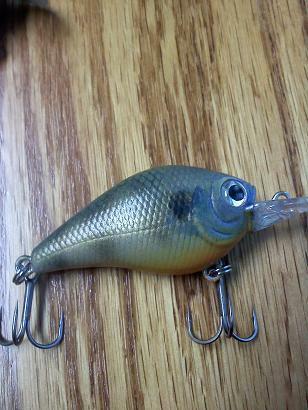 ive noticed alot of good bluegill patterns on here.anyone want to share their formula for it? i have used the search feature so please dont berate me, gentlemen, does anyone have a recipe for making opaque paints translucent? i am using folk art paints and this is my first attempt at foiling. i am not real proud of my first foil jobs, but as they say practice makes perfect. i was thinking i could thin with water, future, or windex to obtain translucence. thanks in advance gentlemen, doc. Thinning them should do the trick. I use a mixture of 60% water & 40% Future and thin to my liking. Or you could use some of the transparent base that Createx makes. The transparent base will make your paints more transparent without changing the viscosity. You really should invest in some transparent paints though. They are much more useful than just for painting over foil. 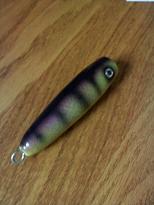 anybody know where I can find the color used on the Lucky Craft "chartreuse shad". I thought someone had mentioned that it was called paliochrome blue at some time. Anyone know if Auto-Air has a similar color? spray dirty orange all but the front of the belly,before drying blot with slight damp rag to take away some paint but not too much,dry with heat gun or blow dryer. 2. Undercoat the lure with a Flat white. I use Americana Snow (Titanium) white. I also Spray multiple light coats flashing each versus one heavy coat. 3. I sprayed the sides (Lightly) with FolkArt 662 Metallic Silver Sterling for my Scale Pattern. It does not take much to achieve a good scale undercoat which will become apparent later. Flash all coats. Now the fun starts, I need to add here, having a computer set up where I shoot really helps. Zooming in on the bait fish pictures for the tiny details and color shifts really makes it easier to see what colors you need and the shading areas. 5. Wrap your lure with the scale material. Ok we are gonna stop here for a minute and go off on a different tangent. I fought and fought scale patterns for quite a while trying to figure out how to keep them straight and not bunching up or curving too much. The important thing I found was I had to stretch up and down straight very tautly. I use of all things CHOPSTICKS from Panda Express. Without breaking them apart, I tape the part where the wood is still together so I can open and close them as needed.I use two sets, one on top to hold the netting straight up and down, and one on the bottom to pull the netting tight. The netting is folded in half with the scale pattern in the direction you want and place the first set of chopsticks through the folded netting. Make sure the netting is straight and not bunched up anywhere. Lay the lure inside the folded netting halves on its back, then using the second set of chopsticks pull both sides of the netting through very tight to hold the lure in place and this will give you your scale masking. After you arrange the netting straight and tight use something to hold the netting in, I use a 12" set of hemostats clamping the netting below the second set of chopsticks. Once your lure is stationary and wrapped then you are ready to move on. 6. Spray body and head with FolkArt 569 Metallic Pearl white. Here it is VERY important, Light coats and flashing each coat. If you spay too much it will produce excess buildup on the netting. You may want to mix a little base white with the metallic here, depends on how much you thin, and your gun. If you mix the base white with the metallic you will only need two or three very light coats. Flashing each. DO NOT REMOVE THE NETTING YET! 7. Now to paint the Vertical bars. You can spray your bars if you wish but for more detail I prefer to hand paint the individual marks. To hand paint, Using FolkArt 661 Metallic Sequin Black, thin the paint in a cap or saucer,(It will not take much, but you need to be able to see the tip of the applicator.) I use both a GOOD detail brush that I trimmed to only a few hairs, or a needle. your paint needs to be thin enough that when it dries it does not dry lumpy. Once again the computer lets me see the details for the bars. 8. I use the netting pattern to paint the individual marks keeping them looking like they are in a fish scale pattern. 9. Once your vertical bars are on, and the paint is dried you can remove the netting. a. Gills, I used Base white mixed with a couple of drops of pearl white and a couple of drops of FolkArt 670 Metallic Blue Pearl. You will want to thin a little base white and pearl white to shooting thickness, then add the blue one drop at a time to get the shade you want. Shoot your gills and any shading areas you want but do not throw away the blue. b. Upper Body shading, Using the same blue you just shot add a little 1-2 drops DecoArt Metallic DAO75 Ice blue and thin accordingly. From front to back or vice versa, shoot a soft shade slightly above the lateral line. This is all personal preference, but you will be shading not coloring or painting. in other words you want to spray very light amounts not producing lines but shades, make sense? One or two passes is all you need. c. Upper Body shading Higher, Still using the same paint you have mixed now, add FolkArt 669 Metallic Periwinkle, only a drop or two, then add DecoArt DA124 Metallic Purple Pearl one drop at a time. You are looking for that bluish purple color. Spray one or two passes high up on the upper body. This you can shade up onto the back with this as you are fixing to spray the back. 11. The back... I would suggest masking the lower body to prevent over spray. Using the FolkArt Metallic black, spray light coats from Front to back moving your gun away from the lure as you go towards the tail, or reduce your paint if as you move if you have a double action gun. You want to Shade the back and very upper side slowly one layer at a time to get that blended color/shade effect. Flashing between passes to insure color fades are as you want. 12. The Belly.. Here once again is shading, but now you want to get that fish gut effect. Mix your base white with the pearl white and a tiny bit of silver if you wish. Once again light coats and flashed between coats till your shading is complete. 13. After all touch ups are completed and the lure colors are complete I use DecoArt DS48 Pearlizing Medium for my last spray. I thin it wayyyy down, so it is very watery, and shoot it about 10-12" away from the lure, moving the lure or gun so it is just misting the paint. The pearlizing is only to give it a shimmer, not to coat.... Too much will hide the paint. 14. I do my gold dusting which is another very subtle shimmer effect. 15. Clear Coat. Remember as you paint, what you see when painting my seem not enough, but once you clear coat the lure, everything will brighten up and stand out. 2. Base coat whole lure white. 3. Belly coat and partially gullet coat, Mix DecoArt Bronze, Anita's Tangerine and FolkArt 4137 Yellow light. Primarily bronze with a drop or two of each of the other colors. You are looking for a orange with a hint of yellow. Do not throw away unused paint. 4.For the Sides mix Americana DA242 Fawn with Folkart 660 Metallic Pure Gold, and Americana DA163 Honey Brown. You are looking for that brownish yellow. 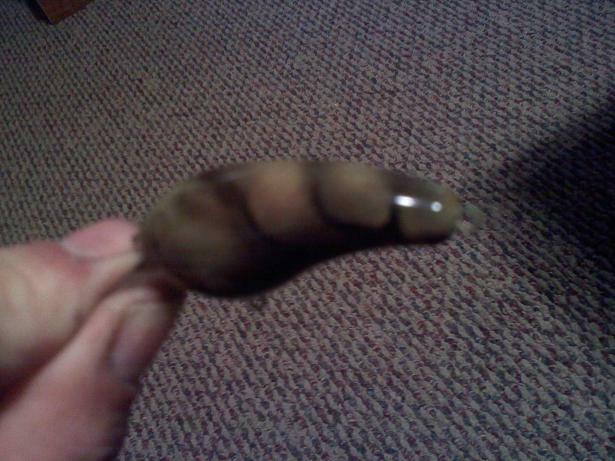 Coat the bait From on top of the head and behind the gill plates with light coats till bait has that color. Save this one also. 5. Vertical lines 1st time.. okay the brownish yellow, mix a drop at a time Americana DA130 Raw Umber till it turns a medium dark brown. Ok another tangent here for a moment. for these vertical lines I use masking tape. I have a 2" tape roll I use pieces of. I tear of about 3" and lay it a top off a old flat lure box. Anything plastic, flat and smooth will work. Lay out the tape and cut strips longways about 3/16 to 1/4 wide. 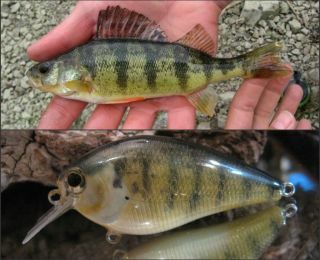 take those strips and create pines to paint from one side of the lure to the other leaving about 1/8" between strips. (NOTE, use a lo stick or non residue tape to prevent pulling the paint off the lure...Did That... ) Spray your vertical lines lightly, do not make too dark as you will see why in a moment. Flash dry and carefully remove tape. Save this paint. 6. Now using the paint you just used, add some lateral highlights using the detail brush or needle I spoke of earlier. Making small dots and or lines work from the gill plate towards the tail. These are more accents than anything. After putting a few dots here and there laterally, do a couple with the Metallic black. Not much just a couple. 7. Now you can place the scale pattern material on the bait. 8. Spray the whole bait with several light coats of the Pearlizing. Do not remove the scale yet. 9. Going back to the vertical bars respray these very lightly unmasked on low pressure with Americana DA067 Lamp (Ebony) Black. You are not trying to coat the lines, but shade them and giving texture with fish scales. 10. After bait is dry remove the scale material. If the paint is flappy, ie... ridged from the scale pattern, heat the bait up with a dryer to make sure paint is set well, and ever so lightly brush off the ridges with some 400 or 600 grit wet/dry sand paper. If you ever over sand a spot just touch up with the detail brush. 11. Mix some white pearl with white base and spray the belly lightly, blending the orange belly area. Do not spray too white, you want the orange/yellow to blend through sort of. 12.Using this white mix a tiny bit of the metallic blue just to barely tint it. Spray your gill plates several times to make them stand out. 13. The brown you saved from earlier spray from head to tail, shading along the back as you go. Do not mask this time, over spray adds accents and shading. Do light coats till you like the Upper sides. Now add some of the metallic black and very lightly shade the very top of the back. 14. Using the paint you just had add some accent spots not too many, just a couple to give the bait some character. 15 The orangish yellow you saved from earlier, add a little highlights to the head near the eyes. and by the mouth area. 16. This should put you, pretty close to the same bait. The main thing to realize is that when these colors are top coated it will shine out! Anyone go good mix ratio for a watermealon color using createx ? Wanting to do a watermelon red craw pattern. Anyone got a good mix for a baby bass with createx? Am I the only one that thinks a step by step with pictures on each step would be very helpful for the rookies? ?